$10/pax to defray the costs of the event. Fruits and candles will be provided. Light refreshments will be provided throughout the night. You are also welcomed to bring food to share with fellow brothers and sisters in the Dhamma. Please check our website nearer the date for any unforeseen changes to the above. Thank You. This entry was posted in Ehipassiko Chanting Group ( ECG ) on December 19, 2015 by wayadmin. Fees – We welcome donations to defray the costs of holding the retreat. 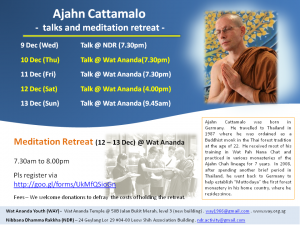 Ajahn Cattamalo was born in Germany. He travelled to Thailand in 1987 where he was ordained as a Buddhist monk in the Thai forest tradition at the age of 22. He received most of his training in Wat Pah Nana Chat and practiced in various monasteries of the Ajahn Chah lineage for 7 years. In 2008, after spending another brief period in Thailand, he went back to Germany to help establish “Muttodaya” the first forest monastery in his home country, where he resides since. This entry was posted in Forest Way and tagged Ajahn Cattamalo, Dhamma talk, Meditation, Retreat, SMS on December 12, 2015 by wayadmin.